“I assert that there is not a Jewish nation. The members of my family, for instance, who have been in this country for generations, have no sort or kind of community of view or of desire with any Jewish family in any other country beyond the fact that they profess to a greater or less degree the same religion. It is no more true to say that a Jewish Englishman and a Jewish Moor are of the same nation than it is to say that a Christian Englishman and a Christian Frenchman are of the same nation: of the same race, perhaps, traced back through the centuries – through centuries of the history of a peculiarly adaptable race”. “Will you be celebrating Yom Haatzmaut [Israeli Independence Day]?”, he asked. “You betcha I won’t!” I answered. The man responded with a predictable expression of bewilderment. “I’d rather be commemorating the Nakba”, I said. “Nakba? What’s that?” He wondered. “It’s Arabic for ‘catastrophe’”, I explained, “when the vast majority of Palestinians was expelled”. “But I love holidays like for example Pesach [Passover]”, he said. “Alright, but that’s a religious holiday. Independence Day is not a religious holiday, unless you consider nationalism to be religious”, I said. “If you really are in any doubt about it being a Jewish holiday you can go to the Synagogue in Copenhagen tomorrow night as well as most other synagogues where there are special services and there are prayers on Thursday that you only say on Holidays (Hallel) and of course it is a day off and therefore a holiday in the Jewish state”, he wrote. So you see, this notion of an extra-territorial, Jewish ‘nation’ has been subscribed to by very many Jews around the world – and makes the Israel case a mixture of religion and nationalism – but not nationalism in the sense that we normally attribute to the term. Why is there no Israeli nationality? The Jewish ‘nationalism’, as embodied by the State of Israel, literally means that there are no Israeli nationals, and that there cannot be. It may sound surreal (and should) to those who are not yet familiar with this bizarre concept – but even more bluntly put, Israelis don’t exist in the national sense – only as citizens. “Jewish” is defined as a “nationality” (alongside some 130 other recognized ‘nationalities’), and the purpose of this construct is simple: Since Israel defines itself as The Jewish State, and wishes to cement that concept fully as the Nation State of the Jewish People, the only ones who actually enjoy national rights, as opposed to merely citizenship rights, are the Jews. And yes when I say ‘the Jews’, I’m not accidentally generalizing – this is a generalization that Israel itself makes, an extra-territorial generalization, which entails that any Jew from anywhere can ‘return’, ‘ascend’ and receive automatic citizenship and a subsidy welcome package from the Jewish State. This even includes people who are not Jewish by Israeli orthodox law, merely by third generation paternal affiliation. These are fantastic terms for Jews all over the world – I mean, why wouldn’t you want such an ‘insurance policy’? “To all the Jews of France, all the Jews of Europe, Israel is not just the place in whose direction you pray, the state of Israel is your home”, he tweeted. “When the Jews are told that Palestine is their national home, every country will immediately desire to get rid of its Jewish citizens, and you will find a population in Palestine driving out its present inhabitants”. How insightful. Montagu elucidates not only the Judeo-centric concern – but the Palestinian one. And with all the Jewish concerns, it is the Palestinians who have had to pay most dearly for this Jewish ‘insurance policy’. The “Jewish nation” has for them meant dispossession, and it is a continuing matter. 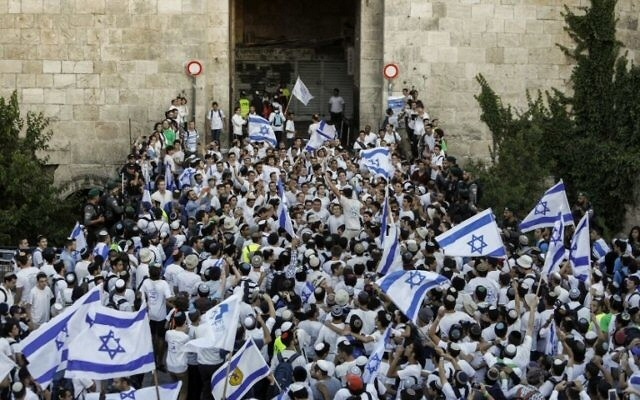 Jews around the world insist on their “birthright” to Israel, while those who were actually born there and have ancestry from time immemorial, are dispossessed. And when some Jews protest this, they even get the finger (see above how ‘Birthright’ founder Michael Steinhart reacted to Jewish protesters calling for boycott of the free trip to Israel for young Jews). But giving the finger to Jews is the least of it. That finger has been given to Palestinians all the way through, that’s what it’s all about. The Jewish ‘nation’ idea is about them being dispossessed and stripped of any national affiliation with their homeland, for Jews to ‘return’. That’s what Israel’s ‘independence’ is about. It means ‘we don’t need Palestinians’. Because we already have a ‘nation’ – the Jewish one. This is the central myth that needs to be dismantled – that of the ‘Jewish nation’. It is the absolute core of Zionism. Everything that Israel does stems from this notion, of the “Jewish nation”. For Judaism to actually survive this horror and become a mere religion or societal tradition within modern constructs of ‘nations’, the myth of the ‘Jewish nation’ must be deconstructed. The archaic concept of a religious-conditioned ‘nation’ must give way to the modern, enlightened version, wherein the term basically defines those who happen live in a given territory in a given time, providing them with justice, freedom and equality. Dispossessing the vast majority of those under the pretext that there’s a ‘nation’ waiting to take their place cannot be the solution.